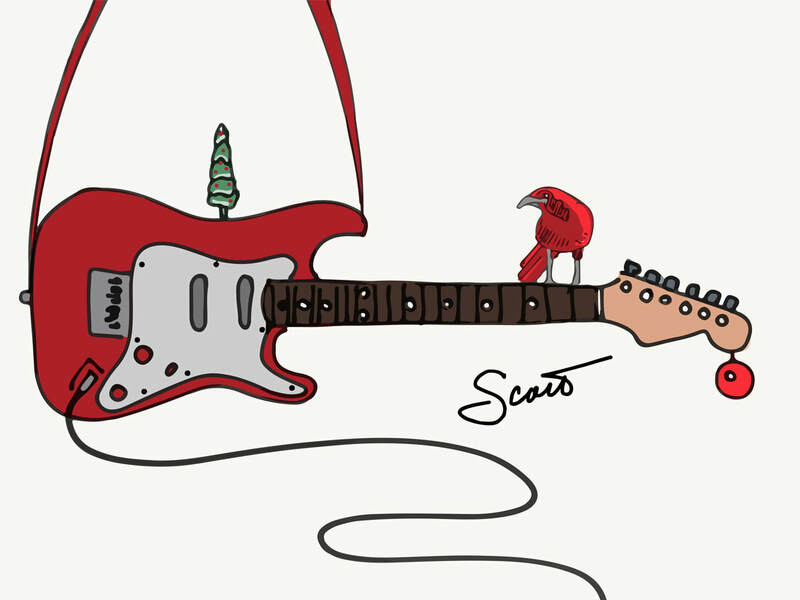 Welcome back to Scott's Little Artsy Letter. I'm ready for the weekend. I've worked hard this week and I think I've earned a bit of R&R - maybe even some golf! If the spirit moves you, leave a comment on my website, send me an email, forward this email to someone you think needs a smile, or just smile yourself. That would make me happy. Last week on the way back from visiting my dad in Prescott, I found myself in a 10-mile long traffic jam. There was a fire on the side of the road on highway 17 which literally backed up traffic for miles. That meant It took me over three hours to get home. Some folks in LA would consider that a normal commute. For me, it was a quite a diversion from the norm. I was lucky to have stunning scenery on the way home and this time on my weekly drive to and from Prescott, I got to slow down and take it in a bit. Dad's 89 years old and the oldest of the Montreal Attenborough clan. Witnessing this time in his life made me think a bit about my own future. What will happen if and when I reach the ripe old age of 89? I guess only time will tell. It has to be challenging to operate on a day to day basis with memory slipping and the body weakening. I always remember my dad as a very robust, active and fit person. He was always a very disciplined man with a mind of his own. He has always worked out and he always played golf. He's had a very good life but, alas, working out and golf have left him behind. He's also a proud person who wouldn't ask for help but he's is certainly grateful help when it arrives. Dad and his partner Peggy have grown old together. They operate so much better together. The place they are living now is called Alta Vista. I can't say enough good things about the staff there. They are so very helpful, caring and kind. This weeks artist is all about color. Though she works in other media I think she is primarily a watercolor artist who paints with vivid and striking colors. The images she creates are representative but somewhat abstract. I really like her style. 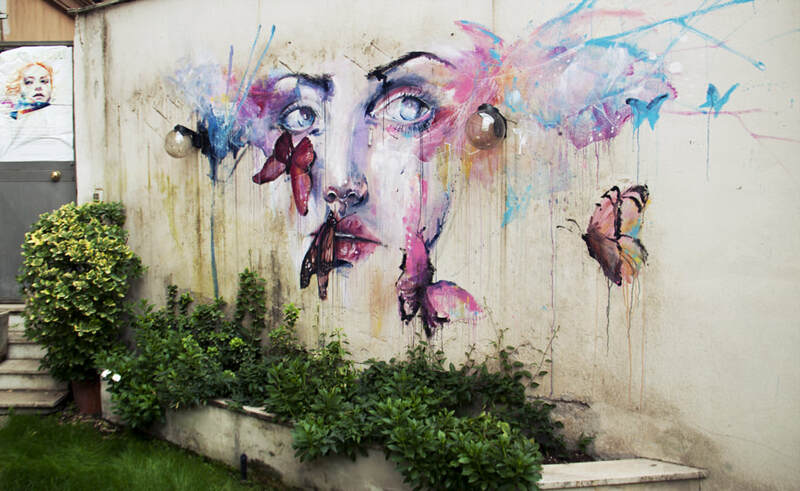 I would like to introduce you to Silvia Pelissero, an Italian artist, who goes by the name Agnes Cecile. She grew up in Rome and currently still lives and works in her hometown. If your gonna pick a town to do art, Rome would be a really great place to work. Though she studied art in high school she has not had any advanced formal training. I'm drawn to this artist's splashy colorful paintings. The way she lets color roam free on the paper but somehow keeps the paint under control is very interesting to watch. She appears to encourage and somewhat encourages what Bob Ross would call "happy little accidents". See how she plays with color to create interesting compositions in this wall mural she painted. Though she is very young she has produced a quite extensive portfolio. I guess if you're from Rome you've got a lot to live up to. I have seen others try to paint in this kind of style and some are very good. I have enjoyed watching her create many paintings on YouTube. check it out. I think you might like what you see. It's been a great week here in the desert. The temperatures are starting to rise a bit. This week's highs were in the eighties and next week is promising nineties. You know where this is heading, don't you? Last summer the highest temperature here was 120F / 49C. Change is all around now as one season gives way to the next. I'm sure it's the same in your neck of the woods. I like to get out for a walk almost every day. Walking just makes me feel good, especially when the weather cooperates. By stepping out and moving my legs I keep myself sane(ish) and in better shape than I'd otherwise be as I sit behind a computer or a painting umpteen hours every day. Operative word, "sitting". Sitting's not one of those nice active verbs. It's not like running, jumping, swimming, climbing, or walking. It's passive, reserved, shy, retiring, blah. Though I do like a nice sit after a long walk. That's relaxing and restoring and not blah at all. It's also easier to read a book, drink a cup of coffee, or use a knife and fork, or type while sitting. I guess sitting does have a use. It's just that sitting and I have a far too intimate relationship. I like to keep my distance so I don't get sucked all nice and cozy into the armchair vortex of slothfulness. Walks give me a chance to "stop and smell the roses", admire the clear blue sky, or the mountain views along the way. There are so many beautiful things to see if you pay attention. I love watching the trees begin to unfold their leaves and the flowers open up to show off their goods. I guess lots of people like this time of year because poems about flowers and spring are all over the place. You won't find me waxing lyrical with eloquent profundity about their beauty. I'll leave that kind of thing to the likes of Mr. Shakespeare. Okay - here's a bit of one I like by Mr. Wordsworth. Let me say simply that the flowers here are gorgeous. Of course, many pretty things have very effective ways to protect themselves. I'm not talking about bodyguards either but I've found the prettier the flower the more vicious the defense. Some of the plants that sprout flowers here happen to be prickly, unforgiving and can be downright dangerous. I wouldn't want to get too close. To get the best effect when you stop and smell the roses though you have to pay attention and appreciate them too. That's what I try to do. I'm usually irritating to walk with because I'm always stopping and snapping photos of things that I find interesting. I'm kind of like a child. Have you ever seen a cactus flower? It's quite a sight. 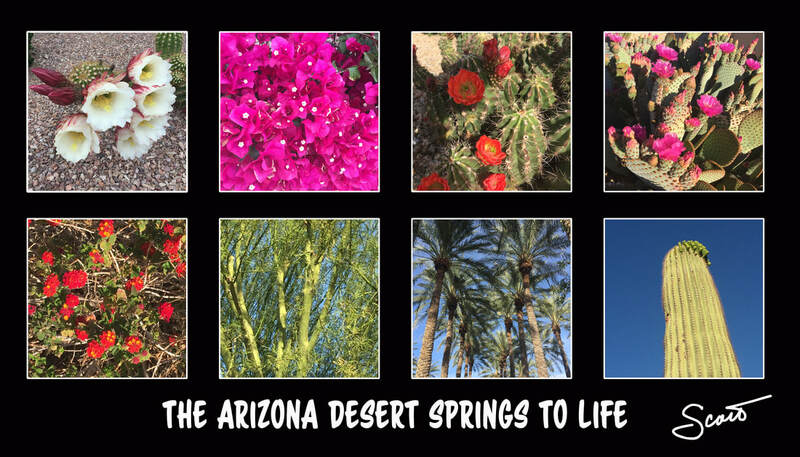 Here's a selection of photographs I've taken over the last week of flowers, shrubs, cactus, and trees here in Sun City Grand. You can see them below in their fantasmagorical spring splendor. The reds are really red, the purples very purple, the palo is quite verde, and the saguaro is just itichin' to pop. I'll have to keep an eye on that one. I hope you get a chance to enjoy the changing seasons in the next month or so before you have to start mowing the lawn all over again. Every season comes with its chores.